This frozen pasta salad recipe is one of those make-ahead lunch ideas that makes packing lunches super-easy. 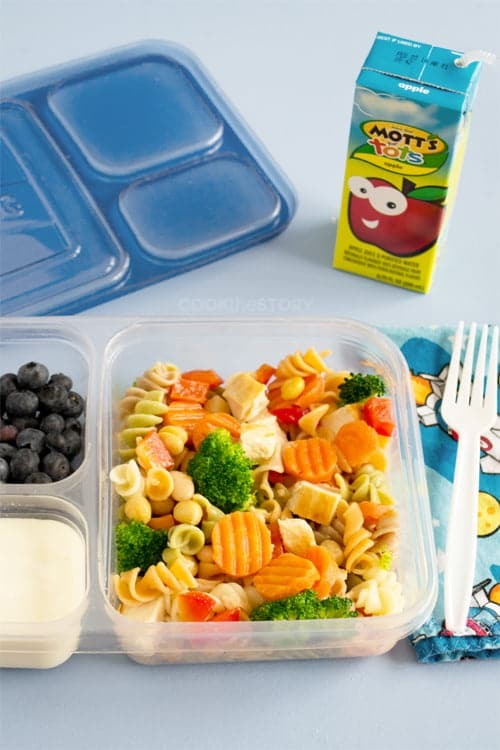 This pasta salad is customizable for your kids and can be turned into other dishes for both lunch and dinner. I know a magic trick. A good one. It causes a healthy, delicious and individually customizable lunch to appear out of thin air, or rather, out of the freezer. Coming up with make-ahead lunch ideas can be tough. Finding time to make the lunches can be tougher. I came up with this frozen pasta last year and have discovered its magical properties. Magical Property #1: This packed lunch is healthy with whole wheat pasta, a bit of chicken, vegetables and beans. Magical Property #2: The pasta salad is made ahead and frozen so it takes only moments to prepare it when you pack lunches. Pull out some frozen pasta salad in the morning and put it into a lunch container. It defrosts slowly in the lunchbox by lunchtime. * Bonus magical property: It keeps everything else cool in the lunchbox as it defrosts. Magical Property #3: This packed lunch is customizable. I only put a tiny bit of dressing on the pasta salad before freezing it, just to stop the noodles from sticking together. When you pack the kids’ lunches (or your own) you can add different kinds of dressing to it depending on the person’s preferences. My kids don’t like dressing so I leave it as is but add a sprinkle of shredded cheese on M’s (she likes cheese, J doesn’t). I put low-fat Ranch on mine, Italian on my husbands’. Just put the frozen pasta salad into the lunch container and drizzle with 1/2 to 1 tablespoon of dressing. Once the pasta salad defrosts, it can be stirred in. Those are the main magical properties of this frozen pasta salad, making is one of my favorite make-ahead lunch ideas. But it gets even better than that. See, it can be turned into so much more than a pasta salad. This frozen pasta can become a soup or like a baked pasta dish in your kid’s lunch. 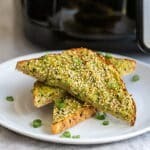 It’s seriously the most versatile of make-ahead lunch ideas! Here’s what you do for a lunchbox soup: Defrost some of the pasta mixture in the fridge overnight. Stir in enough broth (I use chicken broth) to get the liquid-to-solids ratio that you like. Warm it up and put it into a thermos. Here’s what you do for a faux-baked-pasta dish: Defrost some of the pasta mixture in the fridge overnight. Stir in some tomato sauce and shredded cheese. Warm it and put it into a thermos. Those are just two lunch ideas for this frozen pasta salad. There are tons of different things you could add to it to switch it up. You could use milk instead of broth when making the soup. You could use leftover gravy (or jarred gravy) and have something like a stroganoff. Below you can see it mixed with a homemade cheese sauce for a version of mac n’ cheese. My kids are loving it! So the idea is that you have this basic healthy mixture frozen in your freezer in bulk. Then you take some out and mix it with something else to create a number of different delicious lunch ideas. That’s cool, right? But you know what? I’ve also used the frozen pasta for quick dinners. The kids’ favorite is when I defrost it and mix it with Alfredo sauce and then top with mozzarella and breadcrumbs and bake it. But it also finds its way into all kinds of dinner soups and stews. 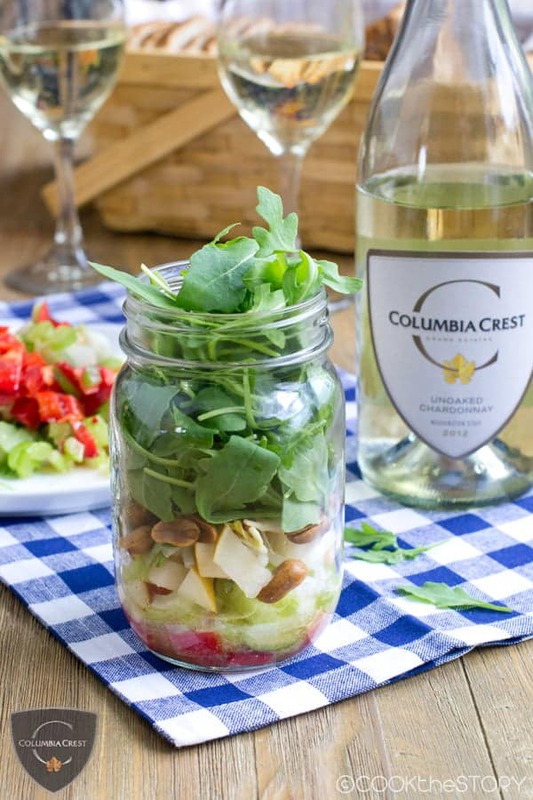 For more make-ahead lunch ideas, be sure to also check out my recipe for Asian Salad in a Jar. Incidentally, it also makes a great appetizer. I hope this frozen pasta salad becomes one of your favorite make-ahead lunch ideas. This pasta salad mixture is made ahead and then frozen. In the morning put it directly from the freezer into child's lunchboxes where it will defrost before lunchtime. This pasta salad can also be used in different ways. For instance, mix it with broth or milk for a soup, mix it with tomato sauce and cheese for a pasta dish. Cook the pasta according to package directions except, 4 minutes before it's cooked, add the broccoli and the carrots (depending on the size of the pot you're using, you may need to remove some water first to make room for the vegetables). Put the pot back on high and cook for the remaining time. Drain. Return the pasta and vegetable to the pot and cover with lots of cold water. Drain and repeat until pasta is cold. In a very big bowl or large pot (I use a big stock pot) combine the pasta and veggie mixture with the chicken, bell pepper, 2 cans of beans and 3 tablespoons of the salad dressing. (If your family is not big on salad dressing, use plain olive oil). Divide the pasta salad among three (1 gallon) zip top bags. Seal the bags and then lay them flat in the freezer. Every hour or two, go and shake them around so that the bits do not freeze together but instead freeze individually or in very small clumps. 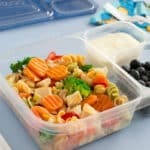 Once the pasta salad is completely frozen, take each bag out of the freezer and drop it lightly onto a hard surface to further ensure that everything is in small pieces (if it freezes in big clumps it will be hard to get the right amounts out to pack lunches and the bigger clumps will not necessarily defrost in lunchboxes before lunchtime). To serve: In the morning put some of the pasta salad into a lunch container. Optionally drizzle with more salad dressing (1/2 to 1 tablespoon is sufficient for a lunch portion). Seal the box and put it into the lunchbox. It will defrost by lunch time as long as the lunchbox is not very well insulated and the lunchbox is not put into the fridge at school. 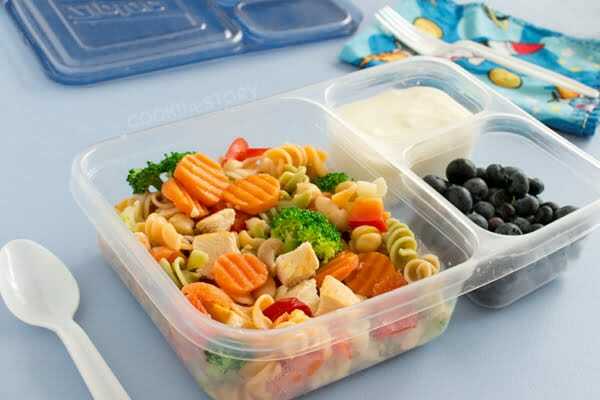 If your child's lunchbox is very well insulated or if lunches are kept in the fridge at school, defrost the pasta salad in the fridge overnight or in the microwave in the morning before packing. Now tell me, what is your favorite make ahead lunch idea? Scroll down to tell me in the comments below or to see what other people suggest. This looks great! My daughter gets an allergic reaction to raw veggies/fruits , so it is extra challenging to get enough fruit and veg servings into her body! I will definitely be making this for her to grab-and-go! Sue, that must be such a challenge. I hope this pasta salad works well for you! Pasta salad always a healthy lunch for kids. Because it contains lots of vitamin and nutrition. Which plays a vital role for growing our kids health. Salad always a favorite lunch item for our kids. 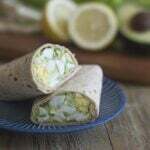 So your above lunch idea help me to provide healthy lunch to my kids. Thanks for sharing your idea. Pasta is always a favorite foods for our kids-isn’t it ? They are everytime try to eat this at their lunch item. So as a mother it’s my duty to provide my kids to his favorite food. It’s help them for growing their health because we all are know that pasta is really a healthy food. Through your above article I also know the importance about lunch boxes for my kids. It’s help them for taking their meals at school. Julissa, I know exactly what you mean. It is our responsibility to keep our kids healthy. 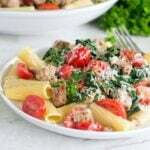 Whole wheat pasta is one item that works well in my house for sure! Now this is a lunch that will keep my kids full! Pasta is a favorite, and I know they’d be over the moon if they found this in their lunches! Great idea! I love all the “magical” properties of this pasta salad! What a great idea to freeze it…and then it can become whatever flavor you want! My kids would love it. :) Gonna give this a try!